Can a Felon Get a Tax ID Number? There are resources available even though felons may not believe they can find a job. Often, they must look at different career path and additional education. Some felons with a desire to own a business may take the steps through the IRS to get a Tax ID Number. 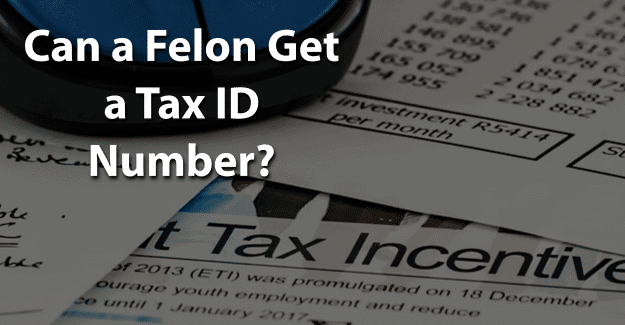 This blog post will address the issue of whether or not a felon can get a Tax ID Number. There are several types of tax identification numbers. A Social Security Number is the most common identification used for personal tax purposes. An individual taxpayer identification number (ITIN) is a tax-processing number available for certain nonresident and resident aliens, spouses, and dependents who cannot get a Social Security Number. An individual taxpayer identification number is a nine-digit number issued by the IRS to those who need an identification number but who are not eligible for a social security number or an employer ID number. A taxpayer ID typically uses the owner’s Social Security Number for the business tax. Since the business files and pays taxes through the owner’s personal tax return, the Social Security Number is the only taxpayer ID number required. An employer identification number (EIN) is also called a Federal Tax Identification Number and is used to identify a business that is registered with the IRS. It may also be used by estates and trusts that have an income that must be reported to the IRS. Any business that is registered with the IRS generally uses an Employer ID Number (EIN) for the identification of the business. This number is used by all other types of businesses. Banks often require a new business to have an employer identification number before they can open a business bank account. The Employer Tax ID Number is a nine-digit number like a Social Security Number used by the government to identify someone’s business. It’s used to secure financing for the business and is also used when the business files taxes. A Tax ID Number can be obtained by completing an application through the IRS. It requires having a Social Security Number and a business that is located in the United States or a U.S. territory. Registration is simple and a response is given immediately by the IRS. There is no Federal or state law preventing a felon from owning a business. A felon may be prohibited from owning some based on the type of business and its particular requirements. It’s important to be honest when owning a business and applying for a Tax ID Number. If a felony isn’t disclosed but is found on a background check, this constitutes fraud and is punishable. It is a crime to falsify any application which could result in being sent back to prison. In order to be successful in owning a business and getting a Tax ID Number, it’s essential for felons to be honest about their background. They are already viewed with negative perceptions of being dishonest, untrustworthy, and unwilling or unable to follow directions from authority figures. Having their record expunged can give them the chance needed to begin with a clean record and succeed in getting a Tax ID. Expunging a criminal record allows anyone to honestly state on an application that he or she has not been convicted of a crime. It’s a challenge, but it might be worth it for a felon that wants to get a Tax ID Number. Having his or her record expunged and also documenting any training programs, rehabilitation, or additional education could make the essential difference in a felon succeeding in obtaining a Tax ID Number. What do you think about this blog post? Have you or someone you know been in the situation of trying to get a Tax ID Number with a felony? What was that like for him or her, and how did he or she achieve success? Please tell us in the comments below.